I’m eating leftovers from an Indian food cookout at a friend’s apartment in Malate. This happened four days ago, right at the start of the year. An excellent way to begin actually, as I never cooked for anyone outside my family. But then again I never did really cook all my life (that is, if you agree to discount frying or using the oven and microwave) until a few months back. 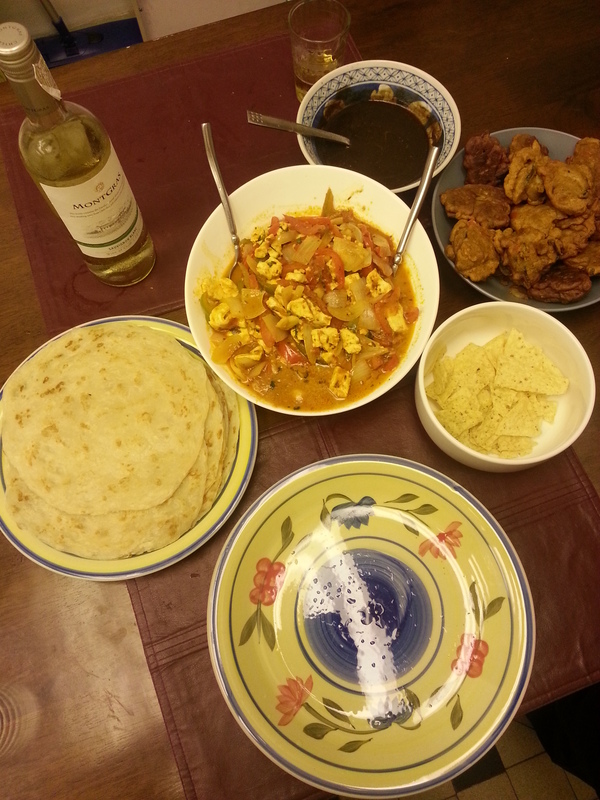 Our humble spread for the New Year’s Indian food cookout (L-R): paratha, paneer khurchan and vegetable pakora. From September to October of last year, I spent six weeks in northwest of India, mostly Gujarat as well as the states of Rajasthan and Uttar Pradesh. I was there for work-related training but on some days, some weeks, we were toured around their cities, brought to as many historical and cultural sites and events as possible. I cannot tell everything in one entry–nor even condense, as you might agree down the line–how immensely that experience changed me, but I will say that the food I had played a fine, fine role. Just incredible. When I got back in Manila, I spent the next two weeks keeping in touch with the new friends I made there through every mode of communication possible—chat, long-distance calls, voice messages, video chats, Facebook messaging, post liking and liking-back, you name it. So at least once a week hence since my return, I either dragged family or friends to eat at various Indian restaurants in the metro or searched for recipes online and attempted to make the food myself at home, as Indian food in Manila’s comparably not cheaper. I finally learned how to cook. I was moved to do it, no other way. More than our pictures, recreating those dishes was the closest thing to celebrating, going back to the good times I had in India. I chose to make paneer khurchan and vegetable pakora for the cookout. I had tried cooking these at home on previous occasions and they were the easier ones to make. 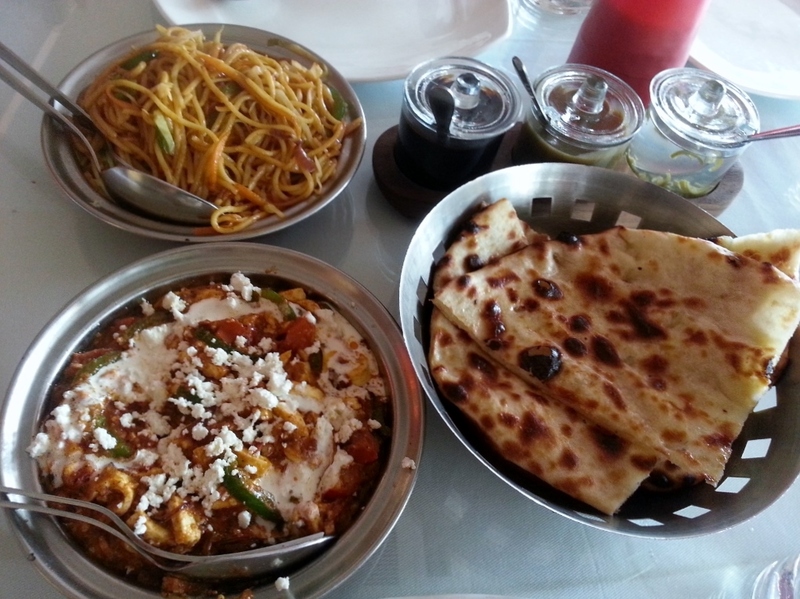 Paneer khurchan with side orders of cheese naan (right) and vegetable chowmien (top). The paneer khurchan in the picture above was what I had in the restaurant of Hotel Apex in Jaipur. I ordered it out of curiosity as it was the first time I encountered paneer (a curd cheese commonly used in South Asian cuisine) cooked in a different way. Before this, the only paneer dish I tried in Indian restaurants in Manila was palak paneer, or paneer cooked in spiced spinach puree. This one, on the other hand, was cooked in tomato gravy with heaps of onion, tomato and capsicum slices. And with generous amounts of spicy as well, as instructed by my Sri Lankan friend Kumu, to her and my satisfaction. This was the last meal I had before we moved on to Jodhpur, but the dish never left my mind. I followed this nice recipe from Sanjeev Kapoor, which was straightforward enough for a beginner like me. At this point, I for one did not know (or actually care) what made a recipe simple, tricky or complex anyway. As long as I have all the ingredients, I should be fine. Lites and Garet helped me preparing the ingredients as I could not consistently slice the onions, tomato and capsicum in the proper proportions demanded by the dish. I did, however, pretty well with slicing the paneer into strips. It was just like slicing tofu or kesong puti (carabao/goat cheese), which by the way are possible substitutes for the paneer (for future reference). Paneer khurchan actually reminds me a lot of this other dish–paneer jalfrezi–I also came across online. They could be the same thing–anyone care to confirm or differentiate? The khurchan part of paneer khurchan, as I made a quick look online, alludes to those scrapings at the bottom of the pot or pan when reducing milk. If you can look closely enough (or just take my word for it) at the photo of the paneer dish I had in Jaipur and compare it with what I cooked in the top photo, you’d see that my version still was a bit too watery. ALRIGHT I admit I didn’t follow the end part of the Sanjeev Kapoor recipe where I was supposed to let the whole mix sauté until the paneer started to stick to the pan (that’s where the symbolic act of scraping would’ve happened I suppose). We’d made the pakora before the khurchan dish and I was worried that the fritters would completely lose their heat. So at the end, the resulting gravy of my paneer cooking was a bit thinner and the curd cheese didn’t stick to the pan. The paneer was nicely soft and tender to the bite, however. And the flavors and the spice kick were already there, which made me happy. Add to that the hot, lush tangle of onion, tomato and capsicum strips. We tore portions off our hot, buttery paratha, folded it, scooped into the watery paneer khurchan and delivered the party anyway to our eager mouths. It was on a lightly rainy morning in Udaipur when I had my first taste of pakora. We had just finished a boat tour around the Lake Palace. From the dock there was a nearby stand where two guys were deep-frying something interesting. From that distance you could see those fritters all golden and oily, such a sharp contrast to the grey sky covering the city. My foodie friend Isha pointed them to me, “Pakoras!”, and told me they also had this back in her home country of Bangladesh. Pakora from the streets of Udaipur. Simple, best. The batter probably contained a mixture of onions, green chilies and thinly sliced potatoes. And their collective spicy kicked a smile out of my face instantly. All those little fireworks happening in my mouth–who cares about this rain! I had those moments in mind when I decided to welcome 2014 with this cookout. I never thought of ordering those steakhouse onion rings again after I had my moment with pakora. 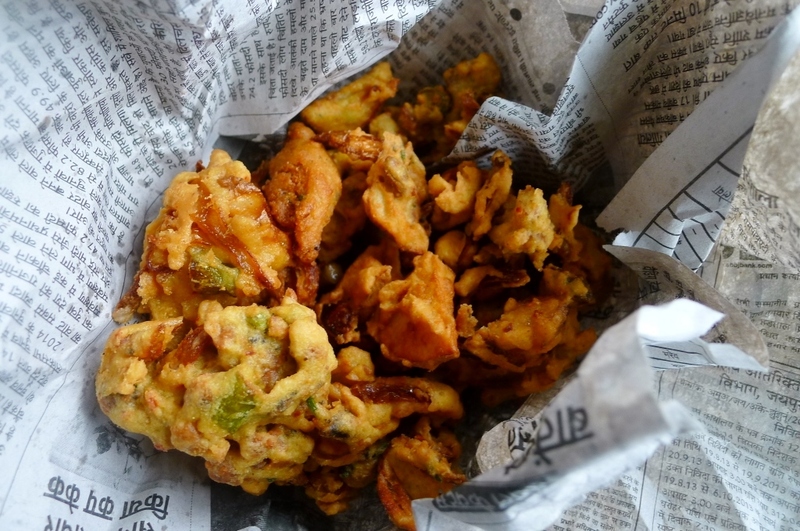 I referred to this recipe from Veg Recipes of India when we made our own pakoras. You can use other vegetables, even vegetable scraps from other dishes you might be making. For my pakoras I chose onion, bell peppers and eggplant. Jay poured the gram flour and spices into a big bowl. Lites mixed, mashed the vegetables tenderly into the batter with her hands while I poured the water bit by bit. While Jay was scooping spoonfuls of the pakora batter into the pan and frying them, I made up a sauce. I bought tamarind paste, among other tandoori and curry spice mixes, from a haphazard grocery run on my last morning in Ahmedabad. I would be flying that night, together with three friends from Myanmar and Mauritius Islands, back to our respective home countries. That tamarind paste was one of the things my sister asked me to buy that I did buy. Some of the others I figured could be bought in Indian groceries in Manila, although at a more expensive price. I thought that this paste was exotic enough, even if the tamarind or our sampaloc was no stranger to Filipino cuisine. The months passed since, however, with none of us using that paste for any of our cooking so I figured I’d turn this into a dip for the pakora. I mixed the paste with water, cilantro, lemon juice, cayenne powder and sugar. All the proportions to my what-am-I-doing but curious taste. I ninja-did it while Jay was frying those pakoras and Garet and Lites were talking the afternoon away. Our supposed late lunch gathering stretched to an early dinner that stretched to a late evening. Matthias came and went. Kaycee came and stayed until we signed off for the night. Everyone liked the food, I was happy with it. I left the apartment that night with the aftertaste still burning in my mouth. I’ll consider mixing in a bit of cream next time to counter any extra chili powder I might throw in while the paneer gravy’s still on the stove. Those pakoras? I won’t change a thing in the batter we made. The same fireworks I first tasted then were the same ones that exploded in my mouth that night. I did leave India, whole body and soul after those quick several weeks. But a part of India came and stayed with me. I can just imagine how the rest of this year will be like.